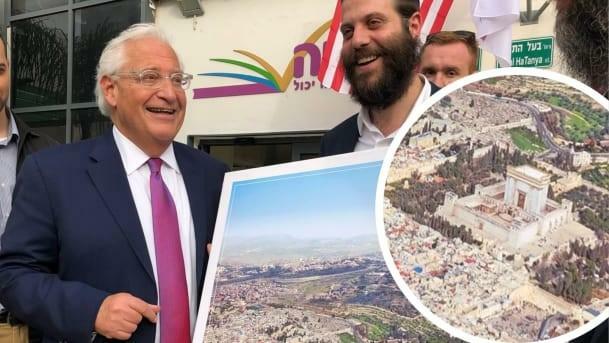 As if US-Palestinian relations weren't already at the lowest point in perhaps all of history, they just sank even lower after a controversial photo (to put in mildly) surfaced of the American Ambassador to Israel, David Friedman, receiving a large aerial photograph of Jerusalem as he toured the largely ultra-Orthodox Jewish city of Bnei Brak, just east of Tel Aviv. As Ambassador Friedman attended an event sponsored by an Israeli charity, one of the staff members presented him with the framed photograph which featured a photoshopped imagined Jewish Temple in the place where Al-Aqsa mosque and the Dome of the Rock currently stand. The Israeli Haaretz newspaper describes the image as "bearing a simulation of the Third Temple" placed in the photograph at the heart of Jerusalem's walled old city, with the 'Third Temple' featured front and center. Israelis refer to the area on top of which Islam's third holiest mosque sits as the "Temple Mount" as it is purported to be the site of two Jewish temples in ancient times, now the location of the Western Wall. There has long been a Jewish and Christian Zionist movement dedicated to restoring the temple, which was destroyed by the Romans in about 70 A.D. — an initiative that's practically impossible because it would mean razing the Islamic holy site. Concerning the long-term controversy that's raged over the fate of the Temple Mount and the Dome of the Rock, the US has long held its official position of observing the status quo of the separate religious communities being allowed access their respective sites. It was unclear at the time whether Friedman noticed the change and was endorsing the picture or not. Though the US Embassy is reportedly outraged at the incident which it says the ambassador did not endorse and was not immediately aware of, it's seems hard to miss the huge stone temple prominently at the forefront of the image. The embassy issued a statement claiming that Friedman "was not aware of the image thrust in front of him when the photo was taken. He was deeply disappointed that anyone would take advantage of his visit to Bnei Brak to create controversy." The official statement concluded with the following: "The U.S. policy is absolutely clear: we support the status quo on the Haram al-Sharif/Temple Mount." A U.S. Embassy official told Haaretz they have demanded an apology from the organization "for allowing one of their staff to present this controversial image to the ambassador during the visit." For its part the Israeli charity responsible for the controversial photograph has issued an apology to Friedman and the embassy, saying further that Ambassador Friedman seemed unaware of the image's content, and that the staff member indeed took advantage of the situation. David Friedman @USAmbIsrael needs not explain anything here. We know where his heart is and where he stands. "Putting Israel first" is a motto he lives by. The Achiya organization's apology statement reads as follows: "We wish to thank the ambassador Mr. David Friedman and the staff members for their professionalism and courtesy ... regretfully the entire event was marred by a cheap political act, the responsible staff member was identified and apologizes and we will deal with the matter internally in the organization." Friedman, however, has been known for engaging in provocations aimed at showing his personal devotion to the Jewish state and preferred changes in US policy toward the conflict; for example, he's long attempted to pressure the State Department to use terminology more friendly to the idea that the West Bank belongs to Israel, something rejected by official American policy. The ambassador has also been known to spearhead fundraising efforts — to the tune of tens of millions of dollars — for Beit El settlement in the West Bank, known as among the most radical Jewish settler movements in the region. In both Gaza and Jerusalem tensions continue to mount after the US Embassy's ceremonial opening in Jerusalem a week ago, which came on the same day 60 Palestinians were gunned down by Israeli live fire after protesters approached the border fence area between Israel and Gaza, with also resulted in over a thousand Palestinians wounded. The United Nations Human Rights Council has since voted to open a formal investigation into the killings.